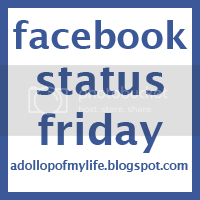 For those of you who participated in Facebook Status Friday the first couple of weeks, I apologize for not posting it the last two weeks. My life has been a whirlwind lately, and I just didn't have the time to do it. SO sorry. But, good news is that I am back, and hopefully won't have any breaks in this shindig again. Without further ado, I give you my favorite facebook status' of the week. Most precious thing in the world: brothers laughing together. my allergies are on revolt against me. We just have a normal ol' weekend planned, which feels kinda nice considering the past several weekends have been CRA-ZAY! Hope all of yall enjoy your weekend! If you want to join in the fun, grab the button, and link on up!